The Czech economy is entering 2018 in an optimistic mood. Consumer confidence increased further in January, reaching its highest level in history. Czech households are more confident about the economy and their own personal finances in the year ahead, they are not concerned with an increase in unemployment, and plan to save more. All these measures of consumer sentiment reached the highest, or one-of-the highest levels in history, bringing total consumer confidence to a new high at the beginning of the year. This optimism has been driven by very favourable conditions in the labour market, i.e. the historically-low unemployment rate accompanied by the highest number of job vacancies, which has led to a pick up in wages. According to Wednesday's survey, almost a third of industrial companies cite the lack of staff as the most important barrier to the growth. In fact, the labour market has become the most important barrier to the growth overall. 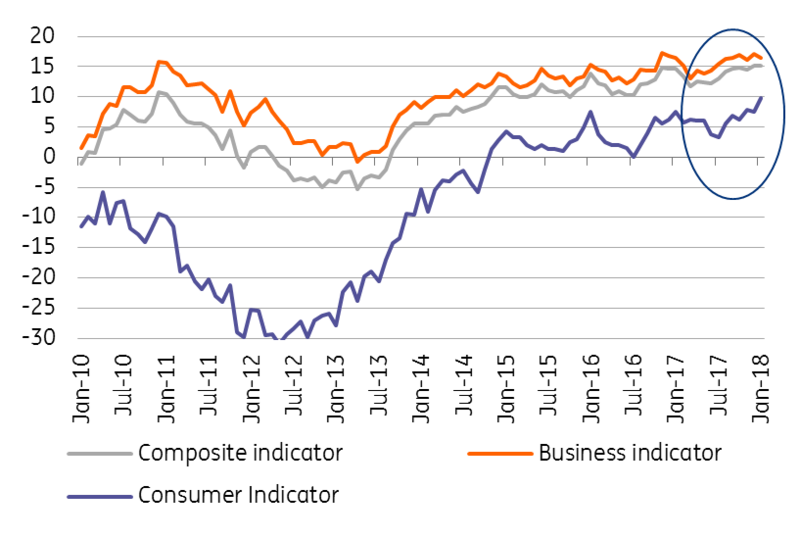 Business confidence has also been gradually improving in recent years, though the average level of optimism has not yet reached the pre-crisis level of 2006-2008. Despite slightly weaker confidence in industry in January-- driven by weaker production expectations for the next 3 months-- confidence in all business segments was above its one-year average this month. As such, confidence in the business sector is the highest in ten years. Capacity utilisation in the manufacturing sector reached 86%, the strongest figure since the end of 2008 and above the long-term average of 83%. Confidence indicators suggest the Czech economy is entering 2018 in a buoyant mood. Although economic growth will slightly decelerate this year, there is still room for further monetary tightening. Today's figures are the last before the CNB's monetary policy meeting and they clearly indicate that the bank should take action. As such, another hike next week is a done deal, in our view.